An Easter Anthem – Regina Caeli – a beautiful setting for double choir by John Harper, first performed at St Paul's Cathedral, London, April 2007. One of the four antiphons of the Blessed Virgin Mary traditionally sung at the end of Compline in Eastertide. Useful for Evensong, festivals of Our Lady, celebrations during Eastertide. 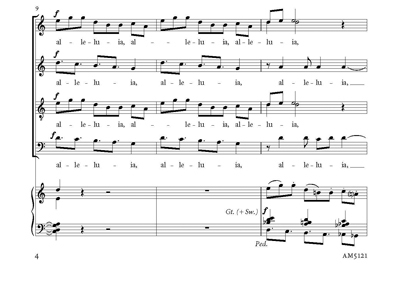 This challenging but accessible piece is available as a printed choral leaflet. First performed in St Paul’s Cathedral, London, on 9 April 2007. Written by John Harper to be sung at Evensong on Easter Monday by the national gathering of the three regional groupings of the RSCM Cathedral Singers directed by Brian Kay; and to mark the beginning of the Royal School of Church Music’s 80th anniversary celebrations. One of the four antiphons of the Blessed Virgin Mary traditionally sung at the end of Compline in Eastertide. Buy your copies of Regina Caeli here. is risen, as he said, alleluia.